The cold snap is over and the clamour to repair pot-holed tarmac surfaces with Ultracrete pothole repair products has begun. But what causes potholes to develop in our roads, paths and drives? The cause is quite simple. Rain-water seeps into cracked tarmac, washing away underlying dirt and surface-supporting gravel. In cold weather the water in the void freezes. Ice expands to occupy a greater volume of space than water and repetitive freeze/ thaw cycles create the forces that begin to break up roads, yards and driveways, leaving unsightly and hazardous potholes. 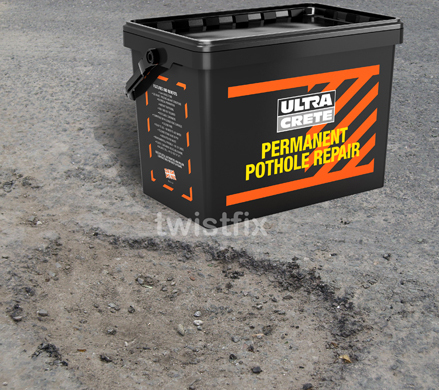 Twistfix supplies a tarmac repair kit to fill potholes permanently. If you want to get rid of those hazardous holes in your drive, path or yard then purchase an Ultracrete repair kit from the Grounds Maintenance section of our web site. For more information then please call us today on 0845 123 6006 or email sales@twistfix.co.uk.